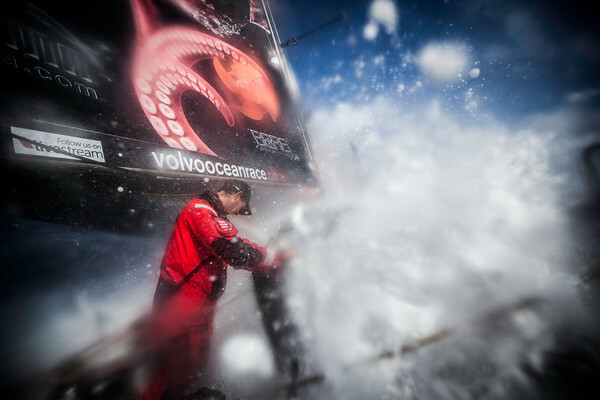 It was a case of enjoy the good times while they last on Thursday, with the Volvo Ocean Race teams revelling in boat speeds of up to 30 knots as light winds up ahead threatened to bring the rapid progress of the past few days to a grinding halt. 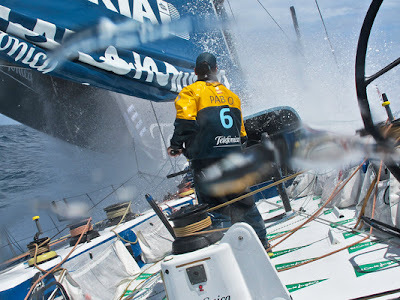 PUMA continued to resist attempts from CAMPER and Telefónica to usurp them from their position at the top of the Leg 6 leaderboard, but with more than 1,500 nautical miles still to sail in the race to Miami a second successive leg win was far from secure. 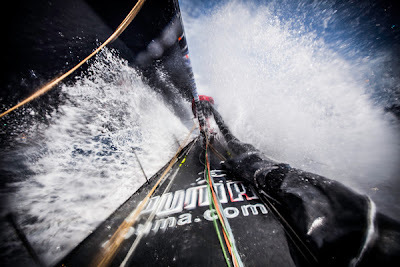 Just five nm split Ken Read’s PUMA Ocean Racing powered by BERG from closest rivals CAMPER with Emirates Team New Zealand at 1300 UTC with Telefónica around 18 miles back. 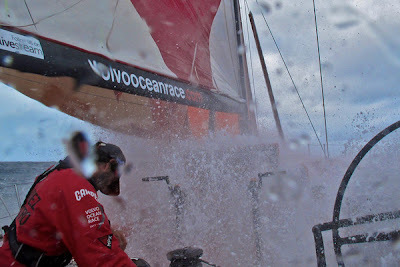 Despite the light and tricky weather conditions forecast for the coming days, CAMPER skipper Chris Nicholson said his team had no plans on relinquishing pressure on the frontrunners. “When we look back through the race, whenever it’s been light and tricky we have fared pretty well,” he said. “We’re going to end up with an area of breeze where a certain amount of luck will come into play and we’re prepared for that. Volvo Ocean Race chief meteorologist Gonzalo Infante said chasers Groupama sailing team and Abu Dhabi Ocean Racing would both gain significant miles on their rivals in the next 24 hours as they hold the better breeze for longer. Having overhauled Abu Dhabi to move into fourth place, Groupama were considering calculated risks in an attempt to catch their rivals around 100 miles ahead. 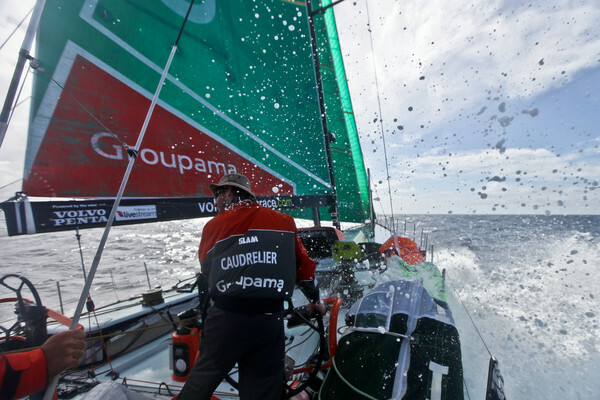 However skipper Franck Cammas said his crew had to be mindful not to risk all and gain nothing. Although frustrated by their slip into fifth, Ian Walker’s Abu Dhabi were looking ahead to potential chances that could come as the leaders slow in the light breezes. “We have got an inside lane at the moment and the breeze is due to drop quite significantly up ahead,” bowman Justin Slattery said. “I think there will definitely be opportunities to close down on the opposition and hopefully come in at them from behind over the next two or three days. 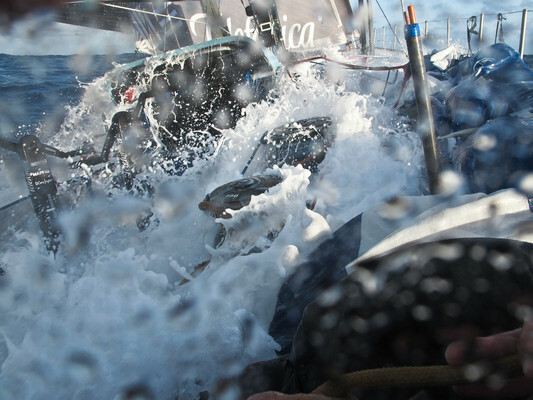 The latest ETA for the leading boats is May 9.